There was plenty to enjoy at the installation meeting of Dalton-in-Furness Lodge No 6828 held at the Masonic hall bearing the same name in the small town which is the ancient capital of Furness. The work of Ian Hallatt in inaugurating David Wilson in his stead was delightful to observe and backed up by a fine supporting cast. Pictured from left to right, are; Bill Morley, Frank Umbers, David Wilson, Ian Hallatt and David Grainger. There was however a little sadness permeating through proceedings as the first business, after the opening of the lodge, was to pay tribute to lodge stalwart John Houlding who had unexpectantly passed to the grand lodge above shortly before the turn of the year. A past secretary, charity steward and a pastholder of an acting Provincial role, John had been a great servant to Dalton-in-Furness Lodge, an enthusiastic Mason and an extremely popular figure in the Furness and South Lakeland Group. John would have been delighted to see some of those whom he had encouraged and coached play a part in the ceremony. 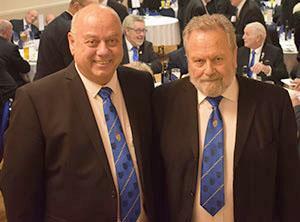 Principal guest was Frank Umbers who was accompanied by another Assistant Provincial Grand Master in the person of David Grainger, who is a member of the lodge. They were supported by 10 acting officers of the Province as well as several group officers led by group chairman Peter Schofield. It has become a tradition of the lodge to venture into the adjoining province of Cumberland and Westmorland once each year to visit compatriots in Cleator Moor. There were representatives of that Province at the meeting headed by Deputy Provincial Grand Master Bill Morley. Those filling the packed temple were able to witness Ian install David in an accurate and sincere manner. 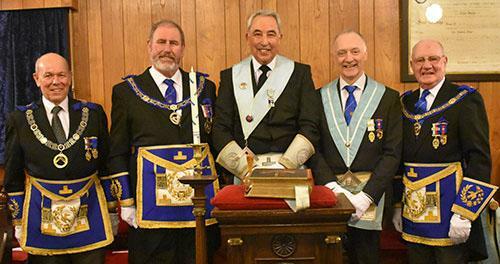 It was a fitting end to his successful year in office during which he had proved to be an excellent ambassador for the lodge having embarked upon very many visits to other lodges. Pictured from left to right, are; David Ozanne, Ron Hiseman, David Baker, Peter Schofield and Owen Osmotherley. Owen Osmotherley undertook the duty of giving the address to the newly installed WM in fine style. David Grainger was called upon to deliver the address to the wardens and Frank orated the address to the brethren of the lodge with both doing so with all the eloquence you would expect from such experienced Masons. Much praise was reserved for the junior brethren who took to the floor to present the working tools of the three degrees. Ron Hiseman, Ferdinand Paule and David Baker deported themselves well and can take pride in the fashion in which they went about their work. Others too played their part in proceedings. Group pastoral care officer Brian Coward addressed the almoner as to his duties, acting Provincial Junior Grand Deacon Reg Wilkinson undertook a similar task in respect of the deacons whilst Provincial Grand Steward Steve McKellar did likewise as regard’s the lodge stewards. Paul Rose MBE (left) with treasurer Peter Dismore MBE. To mark the occasion David presented Frank with a cheque for £1,000 in favour of the Masonic Charitable Foundation 2021 Festival. In addition, it was reported that in the past year the lodge had donated £973 to the hall building fund, £950 to Masonic charities and £350 to local good causes. Frank praised the lodge members for their generosity. Following the formalities at Dalton-in-Furness, the short journey was made to Barrow-in-Furness Masonic Hall for the celebratory meal.The four-course meal with the menu being beef, was thoroughly enjoyed by 112 diners and saw Brianonce again called into service to sing the master’s song. Of course, these things do not just happen and during the course of the evening due tribute was paid to the efforts of secretary Paul Rose and director of ceremonies David Ozanne.The enjoyment of good food in the presence of friendly company proved a fitting finale to what had been an excellent installation meeting. Pictured from left to right, are; Steve McKellar, Barry Fitzgerald, Les Newlands, Barrie Bray, Phil Preston, Garry Norris, Reg Wilkinson and Graham Dowling with David Wilson stood behind.